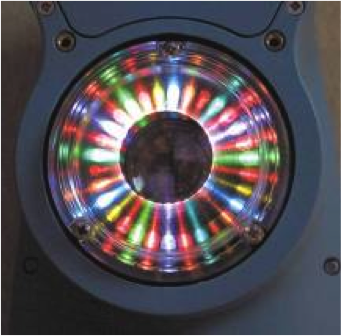 LEDs in the BYK-Gardner spectro-guide. Every year or so, it comes time to send in your instrumentation to be calibrated per your quality control protocols. You receive your instrument back along with a traceable certificate. Or, you may even have a Field Service Engineer visit you on-site to calibrate and certify your instruments. But, that certificate that you hold in your hand, that you file away, what does it mean for you? Adjusts measured values by using reference standards, if required. Includes a certificate that is traceable to international standards. A regular schedule of calibration and preventative maintenance makes sure your instrument produces accurate results not only for one instrument but all your instruments at various locations around the world. BYK-Gardner has multiple accredited Calibration Labs with ISO/IEC 17025:2005 by ANAB, of the ANSI-ASQ National Accreditation Board. What does all this alphabet soup mean for you? It means that you can send your instruments to BYK-Gardner with confidence, knowing that they are held to the highest standards. It means that you can trust BYK-Gardner knowing that their technicians and their test methods are competent. It means that you can feel assured in the quality and management systems BYK-Gardner uses to certify your instrumentation to ISO/IEC 17025. The following table shows the parameters and equipment that BYK-Gardner has been accredited to calibrate, as well as the BYK-Gardner locations that are accredited for each. To contact a service and repair center in your country, click here and select your country in the pull-down menu at the right side of the page. Reblogged this on BYK-Gardner Laboratories Blog.